At Sound Connections it is our mission to make sure every child and young person in London has access to high quality, relevant music opportunities regardless of background or circumstance. We know that there’s a long way to go to achieving this, which is why it’s as important as ever that new projects, methods and approaches are trialled and tested to meet the huge range of needs, gaps and challenges in the Capital. We set up the Innovate fund to enable creation, invention and, as the name suggests, innovation! The aim is that practitioners and organisations find new ways of working that challenge and stretch themselves and the music education sector more widely, and find new means to work effectively in some of the most challenging or least reached contexts. Innovate projects target our three areas of focus: Early Years; Challenging Circumstances; Youth Voice. Groundswell Arts – Dancing Together. Exploring connections between music and movement in Early Years. Based in Haringey. Live Music Now – Sound Beginnings. A new model for music-making with very young children with Special Educational Needs. Working in Wandsworth, Ealing and Barnet. Musiko Musika – World Music Academy: Inspire. 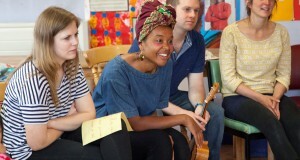 Piloting a new training and creative development course for young leaders in world and community music. Working with young people from Hammersmith and Fulham. Watch this space for case studies and practice sharing from the previous Innovate cohort, whose projects draw to a close this month. If you’d like to apply for funding, we’ll be advertising Innovate again towards the end of 2016.